Shopping around for aquarium controllers can quickly become overwhelming. There are tons of different brands and models available, and each has their own set of modules and accessories that can either make aquarium keeping as simple as possible or ruin the experience altogether. 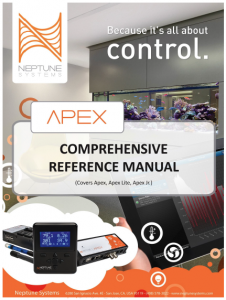 Fortunately, the guys at Neptune Systems have been doing a terrific job of unifying their whole product line, and their capping it off with the release of their Comprehensive Reference Manual for all Apex-based aquarium controllers, including the Apex, Apex Lite, and Apex Jr. Written in conjunction with Alan Jones, writer of the “Unofficial New User Guide”, this new reference manual has anything and everything related to the controller line within its digital pages. The manual, which is free to download HERE, contains 140 pages that give a full breakdown of each controller and module, as well as how to set up the controller systems and interface with them on a regular basis. To say that it its a comprehensive guide is an understatement. It’s more like a complete guide to their entire product line, and a very well written one at that. You asked for it, we made it happen! Many of you are likely familiar with the “Unofficial New User Guide” written by Alan Jones. Well, we have now made it official! Alan has agreed to convert it over to official Neptune branding and to help keep it current going forward. It is now called the Apex Comprehensive Reference Manual. We would like to thank Alan, and all the other Control Freaks out there, for their continuing support of our products! Click the link below to download. This certainly is a great news! The manual really helped me learn about the systems, and it is definitely an important tool for all APEX owners.